All the rain brought us a clement climate, high temperatures are no more, and we now welcome the cool weather! It is time for colourful flowers and bushes and the rebirth of fauna and flora. After observing the remarkable and often comical display rituals of the myriad of bird species on the reserve, it is a pleasure to see the fruits of their efforts, as juvenile birds are fledging and can be seen foraging under the close watch of parents and family. Often chicks fall from their nest and we always try to help them. It is not easy and requires time and patience. A beautiful cut-throated finch, that we have named Lesero, reached adulthood and is now flying with his flock around the camp. We are so proud of this little boy. Another major happening this month is the return of lions to the reserves. As always, they were skittish, but seeing them return was such an amazing moment. This time, there is one female and two sub-adult cubs that have been spotted. Mystery and Mia, two leopards, have been spotted and identified on the reserve. It is always such a pleasure to find a leopard lying on a kopje, looking around and wondering why we are so excited. We hope that you enjoyed the latest update and learnt a lot of interesting facts about African wildlife and life in the bush. The bush is a treasure and an adventure! Every day is different; we just can’t get enough! As you know, poaching is a problem around the area. Poachers come to snare animals. Since January 2016, the volunteers and the staff have found 475 snares and 11 animals dead in snares. 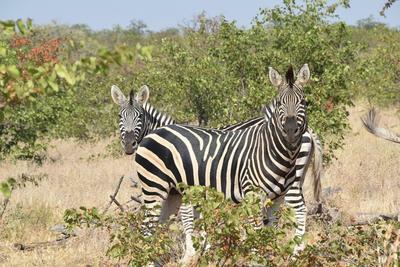 Those are only the ones we found, but how many have been injured, eaten by predators or simply taken by the poachers? 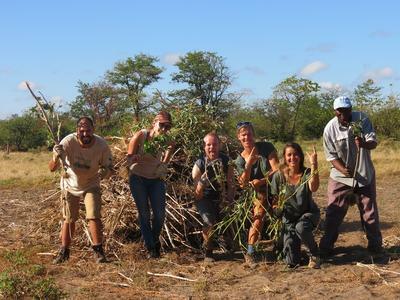 A cluster of land owners decided to bring their resources together and create an anti-poaching unit at the entrance to the reserves. 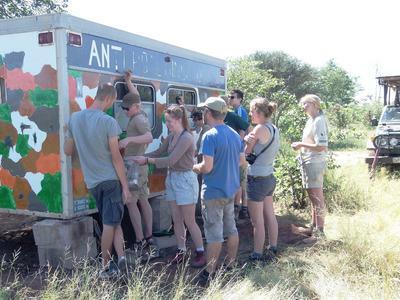 The volunteers and staff have been heavily involved and helped to build a shaded area, install the toilet, and paint the old ambulance wagon and water tank in camouflage colours. They’ve done such a great job. The anti-poaching unit will be the home for some anti-poaching teams who will help us to fight poachers by patrolling the veterinary fence and looking for snares. We hope that the unit will be successful in eliminating poaching in the area. 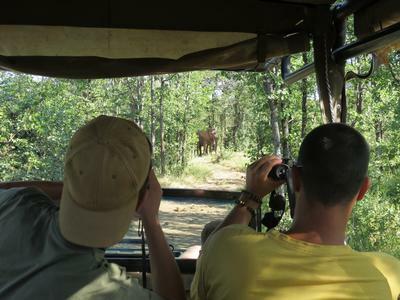 In the tourism industry, animal welfare is rarely taken into consideration and people with good intentions can make the wrong decisions and unintentionally support cruelty to animals. It is for this reason that we have made a wall in the camp where the cruellest animal attractions are displayed and explained. 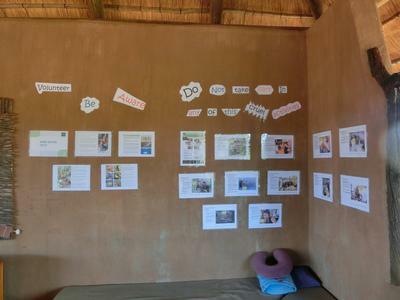 We use this wall to educate the volunteers about these attractions. Often the worst cruelty is hidden from view. The animals in these attractions are usually young and the stress they undergo can cause unnecessary, lifelong suffering. This damages the animals physically and psychologically. They spend their lives in cages or chains and are never free. If you want to know more about any of these activities, just look on the internet as there are many organisations that fight against this kind of tourism. And never forget, wildlife are born to be FREE.